Kay and I love dimsums. We are lucky that there is a nice dimsum place nearby. 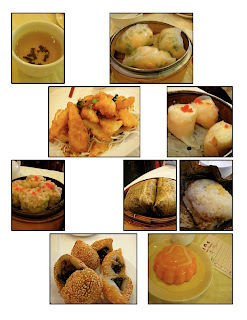 Last time we had dimsum, we tried sticky rice (wrapped and steamed) and it was good. So today we asked if we can have one. But the lady said it's all gone. So we had other dishes and even desserts (sesame balls, my favorite!). Then that lady brought us the rice. We were full already, however, we didn't want to say no to the lady who remembered us. So we had rice too. It was still good, even though we were stuffed. Oooh. That looks yummy. I want to go there too. I knew you had plan so I didn't call you but I was thinking of you yesterday. Hope we can go there on one of the sundays. Yes! Cold Noodles and dim sum! We can have a really long food day. Do you want two on the same day? Hahaha, yeah, it will be a long food day. Maybe we can go to Ikea!